Who wasÂ Mohammad Azharuddin?Â More crucially, *what*Â was he? Those are precisely the questions that, as the end credits roll after 132 minutes of run-time, remain unanswered, feels Prem Panicker. The questions are equally central to any exploration, fictional or otherwise, of the life and times of Mohammad Azharuddin. More crucially, *what* was he? An extensive disclaimer at the start suggests that the movie is â€˜looselyâ€™ based on incidents in the life of Indian cricketer Mohammad Azharuddin, but does not purport to be a true, factual narrative. Fair enough. In a biopic, accuracy is nice to have, but it is not mandatory. To insist on verisimilitude is to confuse biopic with biography. The film uses a court case as its narrative device -- and risibly descends into broad caricature. 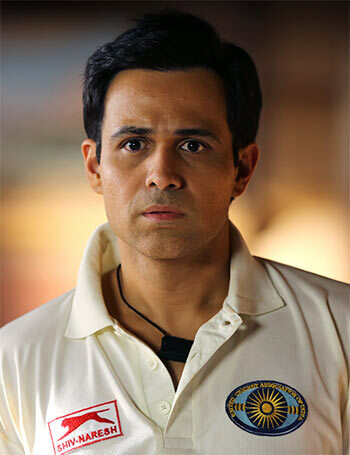 Appearing for Azhar is his childhood friend â€˜Reddyâ€™ (Kunal Roy Kapur), who is initially reluctant to take the case and who undergoes his moment of epiphany when Azhar declaims: â€˜Jinke paas dost nahin hota, unke paas kuch nahin hotaâ€™. You can almost hear the trumpets heralding the â€˜punch dialogueâ€™ moment that Bollywood has borrowed from Tamil cinemaâ€™s overheated template. One example suffices to show the imbecilic nature of the â€˜court proceedingsâ€™. Cue dramatic music, in case anyone in the sparse audience missed the point that a telling point had just been made. To which Reddy -- who for some unexplained reason spends most of his court time in a state of advanced catatonia -- responds by showing a close up of the same dismissal. Key scenes play out in flat dialogue or overt symbolism. The romantic sequences -- first with Prachi Desai playing a one-dimensional Noureen, and then with Nargis Fakhri, who portrays Sangeeta Bijlani as an outsize pout with legs -- play as bathos as unsubtle as the Emraan kiss is predictable. The tagline of the film is â€˜Love him. Hate him. Judge himâ€™ but whoever came up with that line forgot that in order to do any, or all, of the three, it is necessary first to understand him. That is the essence of Mohammad Azharuddin -- he defied all attempts to understand him, to put him in some conveniently prefabricated box. As a batsman, he was sui generis. He played with the lightest bat of his era, using tensile wrists to transform it into a toreadorâ€™s banderilla with which he inflicted on opposing bowlers the death of a thousand cuts. Krishna Prasad, the current editor of Outlook magazine, once asked the supreme West Indies stylist Viv Richards who he most admired among his peers. â€œAzhar,â€� was the instant response. The Proteas all-rounder Lance Klusener, who went for five fours in an over on debut in Kolkata, and then again for eight fours in two overs in the midst of an incredible Azhar assault in Durban, put it more simply: â€œIt is like bowling to a revolving door,â€� he said in exasperation overlaid with reluctant admiration. In the field, he was equally a prototype -- all drooping arms and hunched shoulders and a deconstructed shamble that was the very antithesis of the athlete. And then the ball would come his way and for that one instant -- while he held on to an improbable catch in the slips or intercepted a fierce strike in the covers -- he would uncoil in a demonstration of supreme athleticism as fleeting as it was mesmeric. But it is Azhar the man who most challenges our imagination. By all accounts, he was a simple lad from a middle-class family who doted on his mother and idolised, even fetishised, his grandfather. His first few years in the game were characterised as much by a painful shyness and hyper-politeness as by his inimitable style of batting. Opponents lauded his impeccable on-field manners; the off-field narrative revolved around his devotion to his wife and two young sons. Then came what scriptwriters call the pivotal plot-point, in the early 1990s, when an in-your-face flamboyance began to typify both his batting and his off-field persona -- a period when he produced innings of unimaginable splendor as diligently as he acquired flash cars, designer suits and the ultimate accoutrement, a Bollywood B-list starlet on his arm. â€œI want to write about a fellow who was two fellows,â€� RL Stevenson said, of the impulse that drove him to churn out The Strange Case of Dr Jekyll and Mr Hyde over three days and nights of frenetic creativity. He could have been speaking of Azhar -- the polite, well-mannered â€˜gentleman cricketerâ€™ who once, in Sharjah, lifted his shoeless foot onto the table and began to clip his toenails in the midst of a press conference. Which was the real Azhar? Was it as simple as the need for money to fuel his altered lifestyle and to pamper his inamorata, as urban legend says? Or did it speak to some deep flaw, some hidden fault-line of character, that crumbled under the searing pressure of mass adulation? It is at its heart the story of innocence lost -- the innocence of Azhar, the innocence of unnumbered fans who invested in his magic, the innocence of a sport that had shed its shady origins and reinvented itself as â€˜the gentlemanâ€™s gameâ€™. And it is this that makes the story of Azhar a natural for a biopic. What we get, instead, is a fanpic -- a bland, badly-set soufflÃ© of Bollywood tropes without a soul.